Here we are… 9 days left in the school year. Our last day of school is Thursday, June 21st and our schools are jam packed with activities, special events, and celebrations that typically occur at the closing of the school year. Many of these events are organized and made possible by the Home and School organization and by parent volunteers who spend countless hours preparing for these activities. We are thankful for your dedication and commitment to our schools. Third grade at Forest has been studying life in the 1800s. Throughout the year, They have focused on how the land has changed over time. On Friday, June 1st, Forthird-graders graders traveled to Old Sturbridge Village to experience life in the 1800's. In addition to exploring the museum, students participated in hands-on workshops about cooking and textiles in the 1800's. They also saw a working gristmill and sawmill. Last week, Quinn Middle School grade 7 Pearl Team Science teacher, Jennifer Keck, took her students outside for an ecology field study. In the schoolyard, students looked for individuals, populations, communities, biotic and abiotic factors. Using their Chromebooks, they documented their location on a map, recorded the temperature at their site, took detailed drawings to inventory what they observed, and categorized each item. Hudson High School Graduation - Congratulations Class of 2018! On Sunday, June 3rd, Hudson High School celebrated their 144th graduation ceremony at Hudson High School. This year, 169 graduates received their diplomas. Photos from the ceremony can be viewed here. Congratulations to our graduates on their graduation! We cannot wait to see where life takes you next and wish you all the best! Congratulations to the 18 Hudson High School art students who have artwork hanging in the Public Health office at the Massachusetts State House! 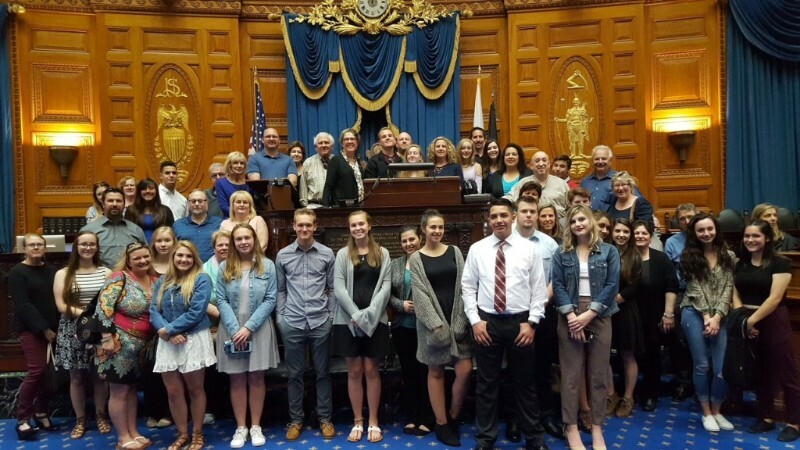 On Tuesday, June 5th, the students, families, and teachers visited Beacon Hill for a guided tour of the State House followed by a reception hosted by Representative Kate Hogan to celebrate their student art show. On Tuesday, June 5th, Quinn Middle School Grade 5 students participated in the Biography Project. This project is a highly anticipated annual event by students! They first are immersed in an informational genre study for various biographical figures. Students then choose a historically significant person who has impacted our world. Then, they read and research, write an informational picture book, and report on that person at the biography fair exhibit. They get to dress up as that person and speak to visitors from the school and community. This event showcases many skills students have acquired throughout the year! 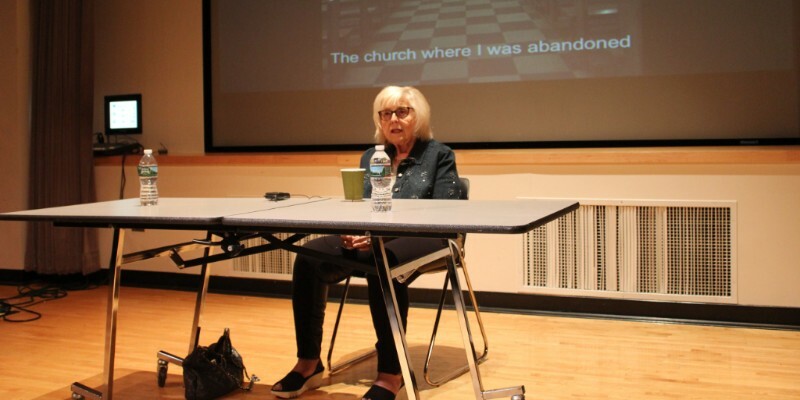 On Wednesday, June 6th, Holocaust Survivor, Janet Applefield visited Hudson High School to speak to sophomores and staff about her experiences of survival and loss during World War II in Poland. Janet was able to evade the Nazi's because of her blond hair and blue eyes. You can learn more about Janet's story here. This year, Quinn Middle School PATH Program's Clinical Coordinator, Jim Brosnihan, and School Psychologist, Julie Locke, along with classroom teachers, have been incorporating Mindfulness into the day to help students succeed. Studies suggest that Mindfulness is "effective in reducing emotional distress and promoting emotional balance, improving attention, and contributing to motivated learning". They started the sessions before school with quiet breathing and focus exercises and recently have moved on to Mindful Walkabouts. Mindful Walkabouts involve students using mindfulness techniques while walking. Yesterday, Hudson Public Schools Unified Track and Field teams competed in some fun and friendly track and field events during their annual Unified Track & Field Day Event with Marlborough Public Schools. Student "champions" and student "athletes" have been practicing together for the past two months for this day. This program pairs students with developmental, learning, and physical considerations "athletes" with students whose mission is to assist with movement, learning and success "partners". This year's event was a huge success and finished with a barbeque celebration. SEPAC Hudson honored Nancy Hudson, Hudson Public School's Adaptive Physical Education Teacher, with an appreciation award for her many years of commitment to the children of Hudson. We would like to thank our sponsors: Bob O'Malley, Hudson Boosters Club, R.F. Wood Foundation, WalMart, and Caitlin Cunningham Parker for singing the National Anthem. On Thursday, June 7, the entire choral program from Hudson Public Schools in grades 4-12 put on a performance for families and the community. The concert culminated into a grand finale with all students singing together "This is ME" by Benj Pasek and Justin Paul from "The Greatest Showman". Photo courtesy of Liz Oberacker. 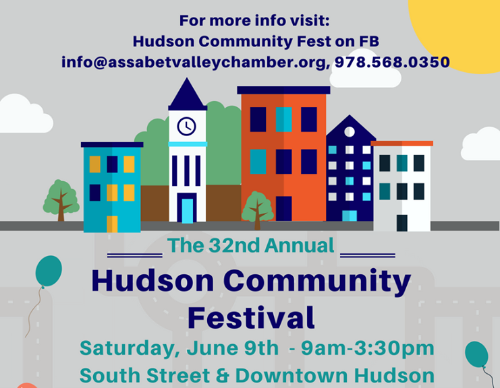 Did you know that tomorrow is Hudson Fest? Tuesday, June 12th - Hudson School Committee Meeting - The Policy Subcommittee will meet at 6:00 p.m. followed by the regular meeting at 7:00 p.m. Hudson High School in Room F101, 69 Brigham Street. *Please note the change of location for this meeting. The Last Day of School will be on Thursday, June 21st. This will be a half-day for all schools in the District.